Marco Rubio announces his niche bigotry for the Republican race. 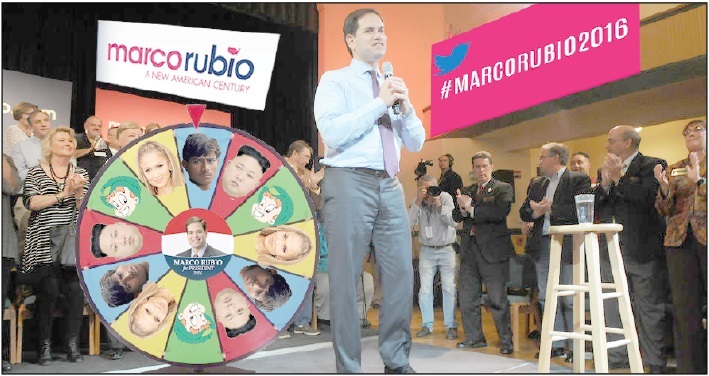 WASHINGTON D.C.— During a private fundraiser this weekend, Republican Congressman Marco Rubio (Fla.) was finally legitimatized himself as a Presidential hopeful by spinning the “Wheel of Ridicule,” spinning “Indians” as the race he will soon be marginalizing. A trusting family man from Florida with a Cuban ancestry, Rubio is not prone to racial outbursts, but declared “I won’t let those frontrunning Republicans get ahead of me!” And with such a statement, the GOP allowed him to enter their secret underground sanctuary to spin the wheel. After the successful Jeb Bush attack on African Americans, the Ben Carson attack on Muslims and Jews, and Donald Trump declaring all Mexicans rapists, Rubio was left with Asians, Puerto Ricans and the throwback Irish as the remaining cultures free on the political hit list. But alas, the wheel landed on the face of a confused Indian man, just missing the sullen face of Kim Jung Un and “Lucky” the leprechaun.